This skin was done for a client who runs a monthly house music party in California. He wanted to help promote the event by having a downloadable winamp skin on his site Link . Hope you enjoy! this is a very nice looking skin. Thanks. I like this skin a lot, but you outta make a version for Winamp 3.
why does it seem that noone knows winamp3 will use winamp2 skins??? 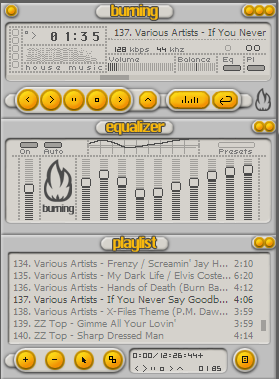 I am using winamp2 for a while longer and this skin is PHAT. Wow - this is sweet! Excellent Work!!! i'm surprised by the size of ur skin !!! yea dude awsome job , could you make it winamp 3 supported though please. this skin RULEZ. Where can I pick up the avs preset? The avs preset is called pulsar, and it is made by elvis. This is very nice! Thank you for doing this!